The Moda (Italian for Fashion) are a clever example of perfect integration of design, style and HiFi technique. As we'll see later, the fancy design of the Moda does affect the musical performances of the loudspeaker itself. If you take a look at the picture above you'll be probably shocked by the electric blue finish of the Moda but don't fret: the Moda are also available in a more classical walnut and cherry wood finish. I'd suggest you visit the Aliante site for better and bigger pictures of all the available (gorgeous) finishes of the Moda. As announced, nothing of the design of the Moda is incidental. Take a look at the sides, for example: you may notice that there are two lateral reflex ports, a solution aimed to minimize the room interactions with the reflex emission. Furthermore, the blue sides are coupled with the real cabinet by means of a damping sheet so that very single resonancy of the cabinet is reduced to zero. Try to knock it: you won't be able to hear a single *tumpf* different from the sound of your knuckles hitting the cabinet. Roughly speaking the Moda come out from the Iperspazio project and are equipped with custom-designed Vifa (woofer) and Seas (tweeter) speakers. Of course you'll find also the usual attention to every detail of the Aliante firm: a 6 dB/oct. crossover with low-tolerance hi-quality passive components and an outstanding overall quality (even the package isn't incidental: two felt demi-rings for the tweeters are included, too!). The Moda aren't exactly small: 250 x 350 x 430 mm. The list price of these babies should be something near 1.630 ECU in Europe and 1800 $ in the rest of the World (taxes excluded). 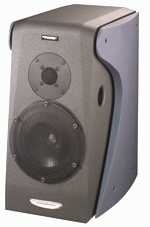 If you need more tech infos on these speakers you should pay a visit to the elegant Aliante Web site (in English). I wasn't aware of the relationship between the Moda that I was going to listen and the previously reviewed Iperspazio but something inside my ears was telling me: hey, dude, they should have some relationship! In particular, the mid-range is very similar even if the rest of the performance is way ahead. The mid-range is hence open and crystal clear, very analytic and with a remarkable level of detail. So you can enjoy the performance of the Moda especially with voices, it doesn't matter if it is opera, rock or large choirs. With large choirs the Moda perform at their best, thanks to the high level of detail you can follow the whole or each single voice of the choir, you can hear each singer grasping for breath or opening the lips to sing. An emotion so realistic that puts the Moda into a league of its own, very far from the cousin Iperspazio which, on the contrary, was a bit dry with large choirs. The high range preserves this level of detail and coherence, being sparkingly vivid and plenty of light. The cymbals are realistically metallic and splashy, though never aggressive or harsh, even at loud listening levels. But the real pluses of this innovative design can be heard in the bass range, very impressive for the size of the loudspeaker and able to rival with floorstanders in the same price range. I don't know if the lateral reflex ports or the stiff and vibration-free cabinet are the responsible for this outstanding bass range, I just know that nothing of this bass range reminds the always controlled but a bit timid performance of the cousin Iperspazio. The bass is now not only deep (like in the Iperspazio) but also very, very powerful and explosive, still always controlled and tight. I've tested it with the most explosive discs of my collection, for example with The Fat of the Land by Prodigy, where the woofers are over-stressed. Well, the Moda always performed at their best, filling the listening room with a bass that is even physical and very, very punchy. With the organ pedals you can test how low can the bass range go and so I did, listening to some of my favourite organ works. Very low frequencies are handled with ease by the Moda, sustained bass notes are as *long* as they should be, nothing less, nothing more than necessary. Even at incredibly loud levels (you should know that some musical instruments DO play extremely loud...so we should try to mimick this at home, whenever possible :-) ) the Moda remain controlled and coherent. Thanks to the high quality of the speakers and to the stiffness of the cabinet the dynamic performance of the Moda is always explosive and walls-shaking. The Moda are able to follow each single variation of the musical program with ease and it doesn't matter if it is a micro or a macro one. Play them loud without fear: nothing seems to impress these Italian loudspeakers, I've even tried with some live hard rock recordings (not exactly of the audiophile kind) but they always replied with a crisp, heart & soul -shaking sound. Maybe my neibourhoods weren't used to have Angus Young playing a guitar solo on their bedroom ;-) or the exploding tympanis of the Berlioz's Sinfonia Fantastica (Reference Recordings edition, a must). You won't be forced to turn the volume down during a fortissimo because of the sound becoming compressed or harsh. Play a drum record at a realistic level and you'll be amazed by the fast sound of these loudspeakers. Here we find the usual forte of the Aliante loudspeakers, that capability to disappear in front of you leaving just the Music behind them. Place them at a 45 degree angle and the soundstage depth will even increase, improving the already very good performance of the cousins Iperspazio. The virtual planes are well spaced and defined even when the musical program becomes complex and difficult to reproduce, for example with organ and choir recordings. The organ always remains placed well behind the choir, while the virtual height of the soundstage goes well beyond the ceiling of the listening room. The stiffer cabinet makes wonders to the focus of the image and the contours of the singers and of the players are always well defined, with a stable position inside the soundstage. You don't need to use special audiophile recordings: if a little bit of ambience information has been recorded into the disc, the Moda will be able to offer it to you. These loudspeakers aren't difficult to integrate into any HiFi chain and I don't have any particular advice concerning the compatibility with amplifiers or cables. Just choose a good amplifier, it doesn't matter how *powerful*, even with few watts the Moda are able to perform at their best. I've even tried them with a 2 Watts (yes, two) tube power amplifier, well, you shouldn't expect loud listening levels but the overall performance is still of high quality, the frequency response and the soundstaging are still very good. Obviously enough, the better the amplifier, the better the performance (thanks, Monsieur LaPalisse :-)) but you don't need to spend mega bucks on hyper-powered amplifiers: just stick with quality, not quantity. Even placing these loudspeakers inside your listening room is quite easy: place them well apart the near walls, use some stiff stands (ranging from 50 to 60 cm of height) and you're done. I'd suggest to avoid too many spikes: just three between the stand and the floor, then some blue-tac between the loudspeaker and the stand, a solution that is a clever mix of *body* and *soul*, if you know what I mean. While you're choosing the right stand for the Moda, take a look at the Aliante Vela stand, a very nice design that is a perfect match for these Pininfarina designed loudspeakers (check the picture out on the Aliante web site). Finally, the biwiring is a MUST. A perfect match of (Italian) good sound and (Italian) hi-tech design, here is the Moda. A very good sounding loudspeaker with a design that signs a landmark for the years to come, different from the ubiquitous (and, let me say, sometimes boring) walnut that is currently used in the 90% of the loudspeakers on the market. Just when everyone is trying to build Sonus Faber clones (Clonus Faber, that is), the Italian designers come out with something really revolutionary and innovative. A step ahead. The required price for these Italian beauties isn't exactly low but please consider the quality of the sound and of the exclusive design. Pininarina is well known for having designed the most wonderful Italian cars of every time, Ferrari and Alfa Romeo, just to name a few. Need I say that I am a proud owner of a *good sounding* Alfa Romeo? The Moda: proudly designed and made in Italia. Thanks to Aliante and High Fidelity Italia for having sent me these loudspeakers for this listening test.